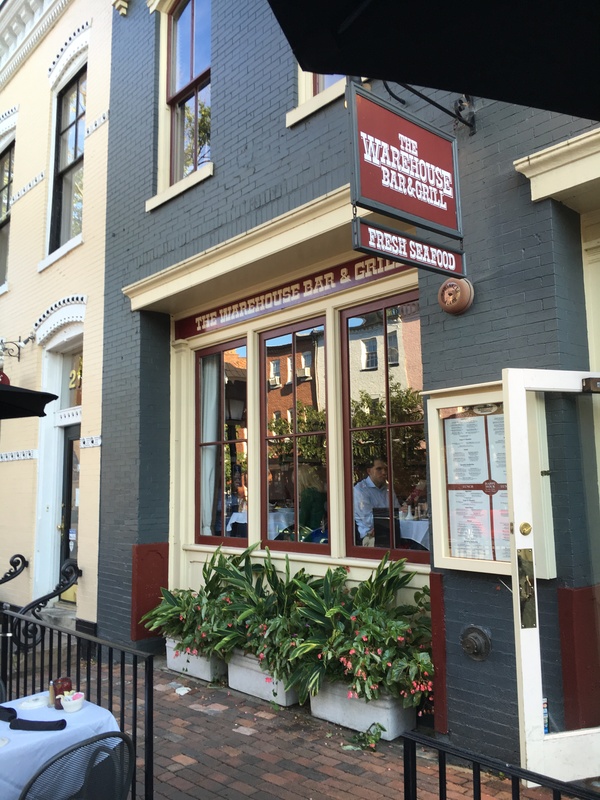 With fall right around the corner we thought that we would venture back to the Warehouse Bar & Grill in Old Town. As Old Town has grown over the years, the Warehouse, as well as a handful of other businesses, has been a part of that growth from the beginning by serving steaks, seafood and some of the best Cajun fare this side of New Orleans. The tag, Bar & Grill, might be a little off target except in the theory that the Warehouse is a low- key, friendly restaurant that is frequented by locals. The service is friendly and swift, but the setting is one of the finest in Old Town. White tablecloths and a raised seating area gives you the feeling that everything else is raised a notch. The raised seating leaves the antique Mahogany bar a few steps down which isolates into its own area, although it is in the middle of the restaurant. 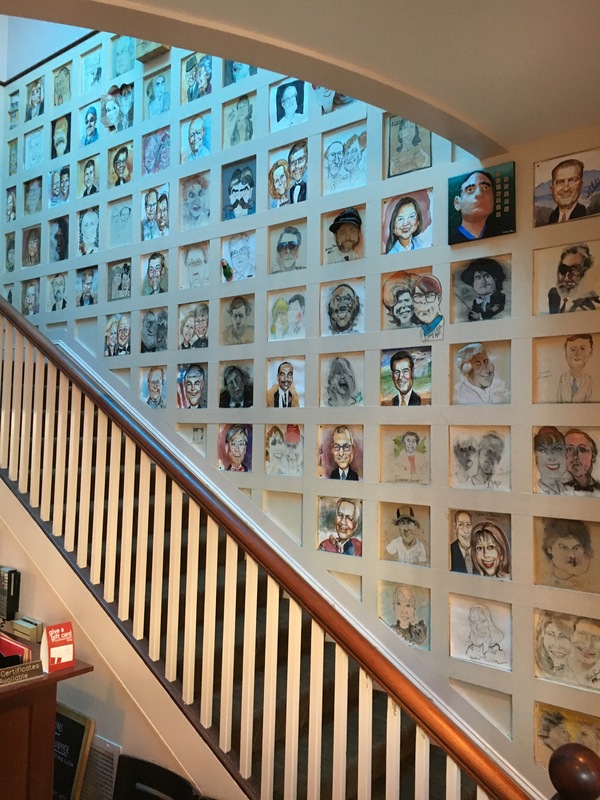 Adorning the short wall railing around the bar and on the wall leading to the upstairs dining area are caricatures of locals that have been created over the years by former resident Brian McCall. Although I lobbied, I never made the wall! On the evening that we were there we were seated in the front part of the dining room by the window that runs nearly the entire width of the wall. The view of the foot traffic along King Street is wide-screen and the elevation of the room gives you a superior view. There is also dining on the second level that offers an even better place to people watch while dining. 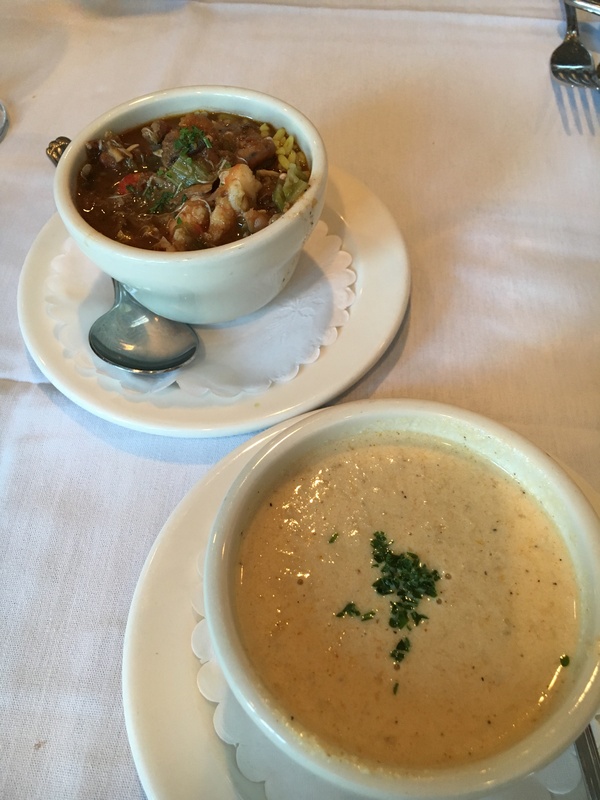 The appetizer and Soup & Chowder list is full of the Cajun influence. Crawfish & Shrimp Beignets, Cajun Fritto Misto, Spicy Pecan Crab Cakes anchor the appetizers while She Crab Soup, Creole Alligator Stew and Seafood Gumbo dominate the soups and stews. I ordered a cup of Gumbo because I knew from a previous experience that a bowl of this tasty dish would fill me up. The rich broth is loaded with shrimp, sausage veggies and the taste is truly down country. The Alligator stew may sound a little challenging, but it is very good with its’ own unique taste. Lani opted for the popular and always excellent She Crab Soup – if you are a local you have had it, if you are a new comer put this on your foodie bucket list. For dinner I ordered a Cajun favorite…Louisiana Crawfish Etouffee. With a good-sized portion of garlic parsley rice to help absorb the rich sauce, I dug right in. 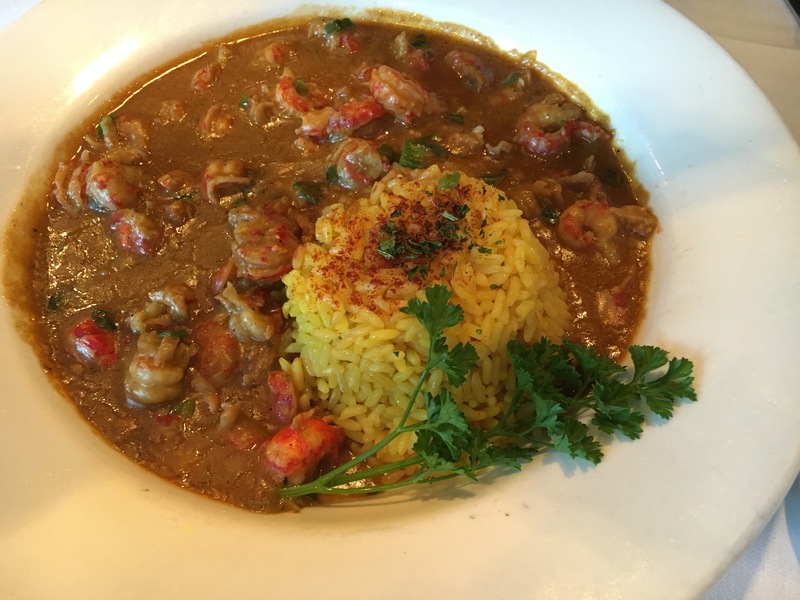 The word etoufee (pronounced eh-too-fey) comes from the French word “to smother.” The best way to describe the dish is a thicker stew, seasoned to perfection and chock full of delicious, plump crawfish and the Warehouse nails it! Although spicy, it is not over the top, but just enough to give it zing but another glass of water is not necessary. Spicy Pecan Crusted Chicken was the other entrée we tried. The online menu indicates that it comes with jumbo lump crab meat and a creole mustard cream sauce, however, we ordered it off of the “Restaurant Week” menu and the lump crab was substituted with baby shrimp in a cream sauce. It was very good at any rate. In fact, the pecan crusted chicken on its own is fantastic. My suggestion is that you ask for the cream sauce on the side. It is served with garlic parsley rice and sauteed spinach. I also want to note that the portions aren’t too big nor too small – they are just right. The rest of the menu is equally divided between seafood and meats, which mostly fall into the category of Warehouse Favorites. Seafood consists of Crawfish-Crab Imperial, Stuffed Flounder “Tchoupitoulas”, Pan Roasted Maine Salmon, Shellfish baked in Parchment, Sautéed Shrimp “Diane”, Southern Fried Catfish and Trout Orleans. 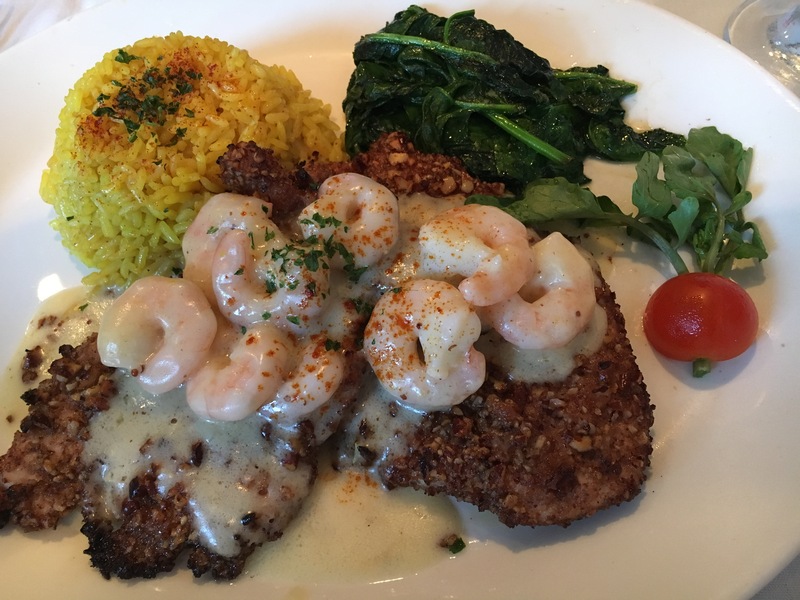 The meat and poultry entrees include the likes of Grilled Filet Mignon, New York Steak, Porterhouse Steak, Grilled Pork Chop, Cajun Veal Oscar, Cajun Style Meatloaf and the aforementioned Pecan Crusted Chicken. There are also a couple of pasta dishes for those who need a pasta fix. On the lighter side, they have a nice mix of salads and specialty sandwiches to offer. 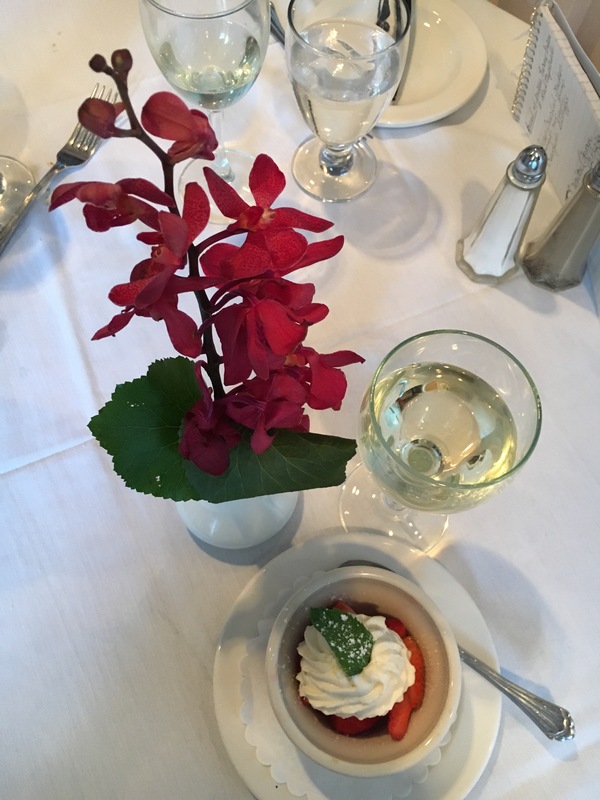 We aren’t huge fans of dessert but we couldn’t bypass the fresh strawberries and cream that were available on our visit. Beautiful ripe berries with a nice dollop of Chantilly whipped cream topped with a fresh mint leaf. The perfect end. The Warehouse has a well-rounded unassuming wine list that has a good choice for every pallet and prices that don’t gouge the wallet. Speaking of wine, the bar at the Warehouse is a local favorite and has a fantastic Happy Hour during the week. They serve brunch on both Saturday and Sunday and have a large local following on Saturday mornings. If you haven’t been to this fine place for a while or if you are a newcomer to the area, make a date to treat yourself soon! See the Warehouse ad in this issue for contact information..